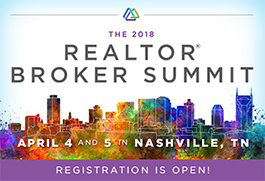 NAR PULSE—Join NAR for the 2018 REALTOR® Broker Summit, April 4-5, at the Country Music Hall of Fame in Nashville, Tenn. Connect with industry experts, tech entrepreneurs and top brokers who understand your business and offer real, actionable ways to position your brokerage for success. Register now! NAR’s yearlong commemoration of the 50th Anniversary of the Fair Housing Act will raise awareness about the significance of this law and create opportunities for advocacy and involvement. NAR has provided a variety of communication resources to help you share with your agents the importance fair housing plays in our industry. We encourage you to join NAR in this commitment. Visit www.FairHousing.realtor to learn about the commemoration, to find materials and resources you can use, and to share what you are doing to commemorate the anniversary. Learn more. As the only accredited institution of higher education focused exclusively on real estate, a Master of Real Estate degree from REALTOR® University will give you the outstanding experience and training you’ll need to manage the evolving challenges and trends of the real estate industry. Next session begins on Feb. 26. Get started. The post 2018 Broker Summit Registration Is OPEN appeared first on RISMedia.